BANGKOK - Refugees in India`s western state of Maharashtra have been granted land ownership rights 70 years after fleeing what is now Pakistan, when the countries were violently partitioned at independence, officials said. The move is part of a wider push to give more rights to certain refugee groups in different parts of India. About 3 million refugees from the Sindh and Punjab provinces in Pakistan are believed to have fled to India, as carnage between Hindus and Muslims sparked a massive migration across a border created as British colonial rule ended in 1947. Refugees in Maharashtra were housed in about 30 government-owned camps or colonies across the state, with limited rights to sell or redevelop their homes. The state government had granted ownership rights to refugees in some districts. Earlier this week, officials said all remaining refugees would get ownership rights, paving the way for the redevelopment of thousands of homes. Now they can sell, redevelop and mortgage the property in which they have been living for more than six decades, chief minister Devendra Fadnavis told reporters. Many of these properties are in a very poor state. About 5,000 refugee families from Sindh and Punjab live in five colonies in Mumbai, which are all slated for redevelopment, he added. The 2016 Citizenship (Amendment) Bill proposed to make illegal migrants who are Hindus, Sikhs, Buddhists and Christians from Afghanistan, Pakistan and Bangladesh eligible for citizenship. Last year, Indian officials said some 54,000 Chakma and Hajong refugees who fled from Bangladesh more than five decades ago will get limited citizenship, but not land or tribal rights. The Tibetan Rehabilitation Policy of 2014 proposed to give welfare benefits on par with Indians, education subsidies, and greater ease in getting official documents such as passports. But it does not address property ownership. 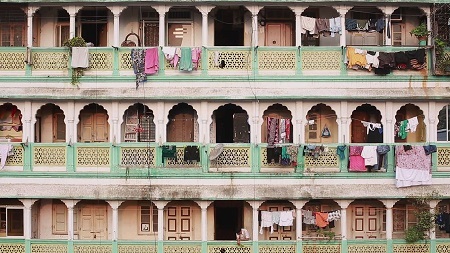 Maharashtra`s decision is led more by a concern about the poor condition of housing in the Sindhi camps, said Sifra Lentin of the Gateway House think tank in Mumbai. Most of the houses in Mumbai are crumbling and not very safe to live in, she told the Thomson Reuters Foundation. But because real estate is so expensive, many have not been able to move elsewhere. At least now they will have more of a say in the redevelopment of these properties, she said. Photo: A resident locks the door of an apartment of an old residential building in Mumbai 28 January 2015. Source: Danish Siddiqui/REUTERS.